OK, here´s my story so far…. I got my first drum kit at the age of 5 as a christmas present from my parents. This was the start of an long and winding journey of percussion and drums. 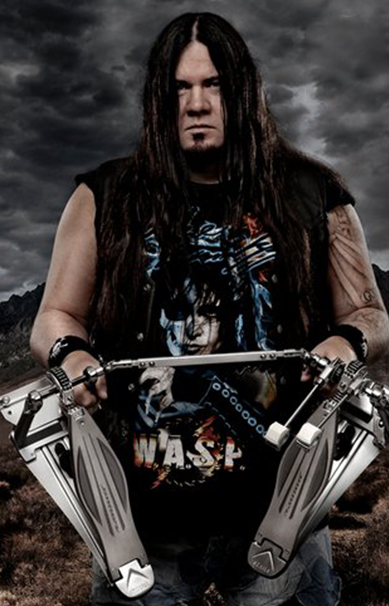 I was born and raised in the small village of Oklungen, a little place outside Porsgrunn in Norway where i at early age met Steinar Gundersen (Spiral Architecht, Satyricon) and formed my first heavy metal band, Essex, in 1983. Me and Steinar sticked together through lots of different bands until 1992, when Steinar moved to Oslo and joined Spiral Architecht. Our last band from 1988-1992 was technical metal act King´s Quest. I joined Sunset Strip in 1993 together with Nils and Thorstein which became Silverspoon and finally Pagan´s Mind in 2000. In 1998 i joined prog metal act Trivial Act which i still am in. I have long experience in drumming: I also joined Black metal band DIMENSION F3H in 2002, FIREWIND in 2003 and JORN ( Jørn Lande ) in 2003. I began beating on the drums in Langangen School band as a 8-year old kid and did not left before I was nearly 20, the last six years my role was as a drum teacher. I took several proffessional education courses in drum technique, as M1,M2, M3, M4, I1,I2 and D2 at Kvitesund and went to high school on music theory classes from 1989-1991. Metal has always been closest to my heart, though. I will always consider myself as a full blown metal drummer! Scott Travis(Racer X), Mikkey Dee, Anders Johanson, Grieg, Bach, Vivaldi, The Beatles, Abba, Dio, Kiss, Yngwie Malmsteen, Tony McAlpine, TNT, RACER-X, Iron Maiden, Ratt, Dokken, Vinnie Moore, Bon Jovi, Accept, Helloween. Tama Starclassic B/B drums, Meinl Cymbals, Tama sticks (Signature model), Evans drum head and Tama Speed Cobra pedal. Two weeks on a desert island with Carmen Electra…..
drinkin´Pina Coladas and smoking cigarettes…..